254 pages | 50 B/W Illus. This book compares two countries with striking parallels in economic and political outcomes, yet with some distinct features in terms of institutional structures, relative size, and culture. 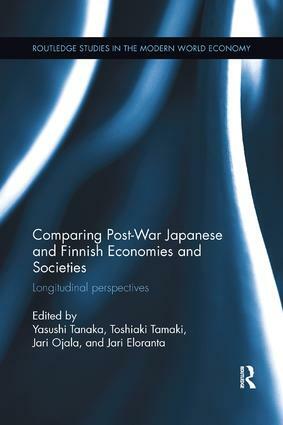 Therefore, this book forms a fruitful platform for the study of the similarities and differences in the economic and societal development of Japan and Finland. Despite their geographic distance from one another and the aforementioned differences, both countries experienced rather similar economic and societal development patterns after the Second World War. The study of these societies both individually and through commonalities will provide a unique perspective on the emergence of modern economies and institutions. The book provides comprehensive coverage on issues such as welfare state formation and society, security and military spending, education system, industrial development, international trade, governmental economic policies, energy solutions, and bubbles and their collapse; thus, issues typical for these countries, as well as most modern states, studied from a longitudinal perspective. Yasushi Tanaka is a Professor of Economics in the Faculty of Economics at Kyoto Sangyo University. He is a labour economist with particular interests in human capital theory, OJT, cooperative education, and economic inequality. Toshiaki Tamaki is a Professor of Economic History at Kyoto Sangyo University, Faculty of Economics. He specializes in economic history of early modern Europe. Jari Ojala is a Professor of Comparative Business History at the University of Jyväskylä, Department of History and Ethnology. He specializes in maritime and business history. Jari Eloranta is a Professor of History at the Appalachian State University, USA, and Adjunct Professor (Docent) of Economic History at the University of Jyväskylä. He specializes in comparative economic and business history, especially 19th and 20th century government and military spending and conflicts.